Note: This guide is now hugely out of date, and we've written a replacement that you can view here. Hey! Never mind all that, let's just get to the game! If this is your first time playing A Valley Without Wind, getting started is easy. First, install then open the game. Click 'Play' on the menu, and a new menu will open up. This time, click 'Create World'. Now the game will ask you to name the world. Personally, I'd suggest naming it “Wayne's World," but really, you can name it anything you want. Now, for the character selection -- every character you have the possibility to select has a name, and a list of personal stats. Don't be overwhelmed with the stats, the most important thing you need to know about them right now is that green is good, red is less than good, and white is average. So, you want to try to avoid a character with a lot of red stats. Once you've chosen your character, he or she will be dropped into your first settlement. This is your first base of operations, and you will likely come back here often. To start, use the 'A' and 'D' keys to explore the settlement, and collect all the various gifts (like books) on the ground that the Ilari have given you. The next steps you should take are mentioned in the top right part of the screen, but we'll briefly cover them here, too. 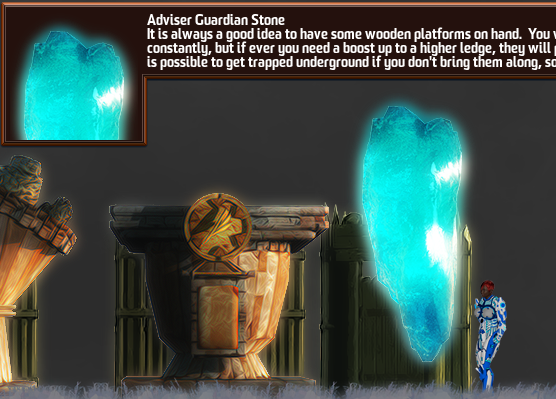 First go and talk to the Adviser Guardian Stone, the big teal colored crystal dude with an inflated sense of self-importance. To talk to him, simply stand in front of him and press the 'E' (also called 'confirm') key. He'll give you tips about the game. You are only required to read the first 5, but if you want to keep reading more, he's got a lot of good information -- and you can always come back later. Ok, now it's time to talk to the green crystal dude -- another vessel of the Ilari. This is the Hearth Guardian Stone. Any time you are low on health just stand in front of him to have your health and mana be completely restored. Also, he'll give you free warp scrolls if you have fewer than two. We'll get to what those do later, but for now, find the spellgem crafting books that you should have already picked up in your inventory (if you haven't picked them up keep searching your settlement till you find them). They look like a small rectangle with a diamond in the middle (if you don't see them in the bar on the bottom left of your screen, try opening up your inventory by pressing 'I', and see if they are there). Once you've found them and you are standing in front of the Hearth Guardian Stone, right click on the spellbook. 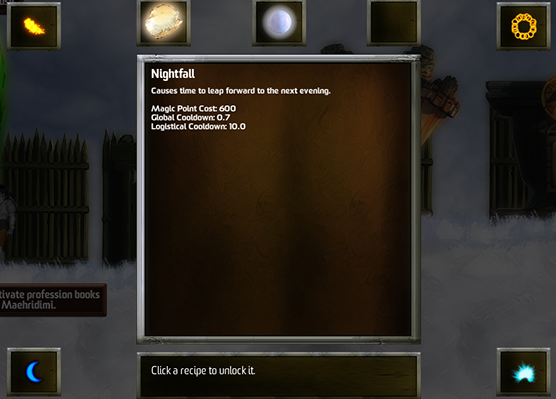 This will open up a display on which you can choose what new spell you want to learn the recipe for. Keep in mind you aren't making the spell at this point -- we'll do that next. The list of available spells you can take here depends on which hearth guardian stone you talk to (there's more than one in the world, but only one in your starting settlement), so they won't always be the same. To start, you should take some sort of ranged spell. Examples include: Fireball (my personal favorite), Forest Rage, and Energy Pulse. After this, since you have four books, go ahead and learn three more spells. Don't worry, you'll find more books later, but having more spells makes it easier to do... anything. You may have noticed that as you were doing this, you gained EXP. There are many things you can do in this world to gain EXP for your civilization. Learning new spells is one. Killing one of the many bosses you will encounter in your travels is another. As you continue to gain EXP, your civilization will level up, making you more powerful and able to face the monsters in higher-level regions. There you will in turn find better gems, which will allow you to craft better/stronger spells. Now we actually get to make some spells! And isn't that what we're all here for? 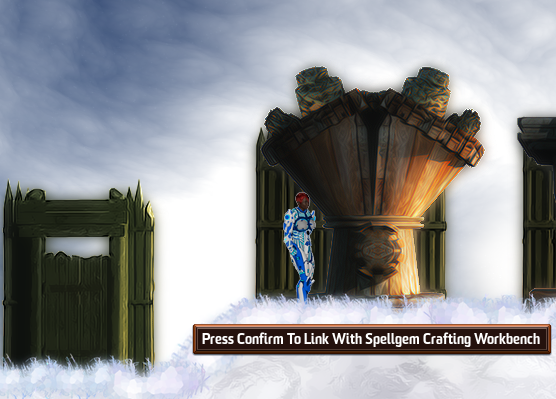 Well, ok, maybe not all of us... To make a spell, stand in front of the Spellgem Crafting Workbench, as shown above. Pressing confirm will open up a new window. 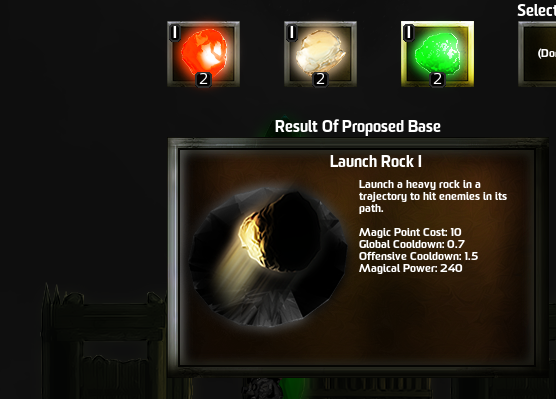 Each new spell consists of a spellgem and possibly 1-2 commodities. As you hover over a gem, the window will show you what spell that gem alone will make. Click on the sapphire. You will see that this can make the Ice Cross spell. If you add a walnut, it will make the Tidal Pulse spell instead; or adding granite will make the Douse Monster Nest spell. 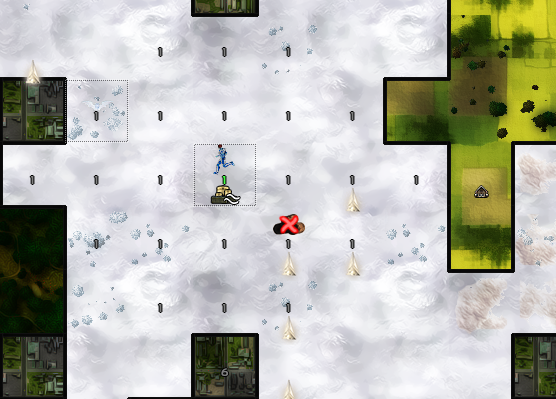 For starters, don't add any commodities, and just click “Done” to make the Ice Cross spell. This is a good spell to have for damaging enemies close up. Now go ahead and make as many spells as you can at this point. While you do have a limited number of gems, you will be collecting many more as the game progresses. One other spell that is crucial is called Ride the Lightning: this one allows you to double jump to reach higher locations, get away from enemies, or escape from caves. Ok, once you have your spells made, you're almost ready to go out and start making the world a better place. Literally. The last thing you need to do is to make a few Spell Scrolls. The Scrollmaker's Workbench is usually right next to the Spellgem Crafting one, and works the same way. The main difference being that this time, instead of raw gems, you're using raw gem dust. I'd recommend making at least a few Heal scrolls, using jade dust. Make any other scrolls you feel you might need or want, as gem dust is usually plentiful enough. Consider the Emit Light scrolls, as these help you see in otherwise dark caves and buildings. The last workbench (that's right, the last one, we're almost done here) you should know about is the Outfitter's workbench. This one works the same as the other two, but is useful for making physical objects, like platforms (which you can use to get out of holes) and protective suits. It's not required to visit this bench before leaving, but you should at least check out what's there. More workbenches will appear as you level your civilization. One last thing to do before we leave: see the circles in the lower left of the screen? That is called your ability bar. Whatever spell or item is equipped in the first circle can be activated by pressing either the left mouse button or by pressing the number 1. The second circle is activated by the right mouse button or by pressing the number 2, and so on. You will want to put your spells and scrolls in the slots that you'll find easy to use. You can do this by dragging them where you want them. Wait, what's that? You don't see all the spells you created? Hmmm, well, if you press 'I', you will see your full inventory open up and the rest of the stuff you took time creating will be there. I'd recommend putting a ranged spell like fireball in the first slot, and a melee spell like Ice Cross in the second, but, you can do whatever you want. Got your bar set? Ok, then let's ditch this settlement! Now comes the real fun! But how do we get out of this settlement? 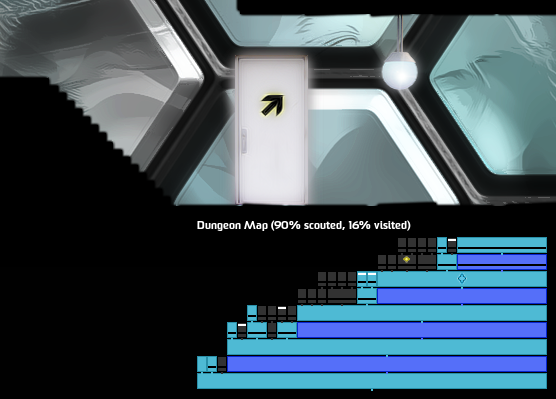 Your minimap is on the upper-left hand part of the screen -- you can press 'M' to maximize it if you want. Your character is represented by a blinking blue dot. On your mini-map, there is a white bar that goes all the way to the top on one side of the map or the other. Head in this direction, and keep going until you leave the settlement. Once you are out, you will see an overhead map of your world. This is where you pick which region you want to explore. Your character starts in the region of your settlement. Press confirm to enter whatever region you're standing on, and use the WASD keys to move around your map to choose the next area to explore. I'd recommend picking one that has the number 1 on it (the numbers represent the level of the region, and the level of the enemies that are in it). This will probably be an ice-age region. As you progress further away from your initial settlement, more region types will come available. Once you enter a region, you are back to the side view again. You can use A and D again to move left and right, and spacebar to jump. Left clicking the mouse will fire your first action in the direction of the mouse pointer if it is an aimed spell, or simply around you if it is a melee spell. Ok, so now what do you do? I'd recommend exploring any buildings you see. 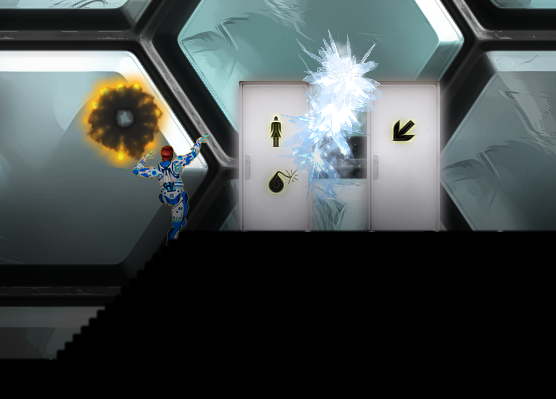 Inside the buildings, you will find things like consciousness shards (which allow you to do things in the strategic part of the game later), health and mana potions, and even gem dust. In regions such as abandoned towns, you should search houses for studies and libraries as well. These are the best places to find more books. After you've collected a bunch of health and mana potions, you may want to consider taking on your first boss. 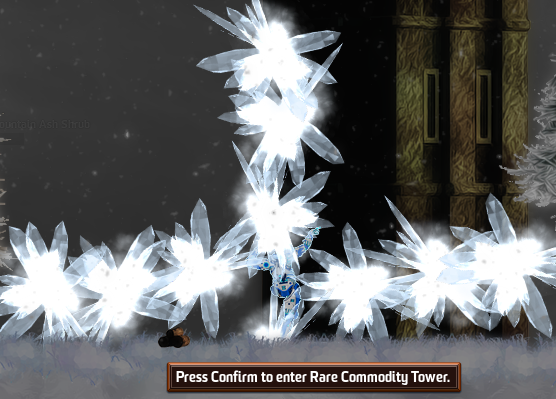 On the map above, you can see a number of rare commodity towers (all the triangular memory crystals, in this case). 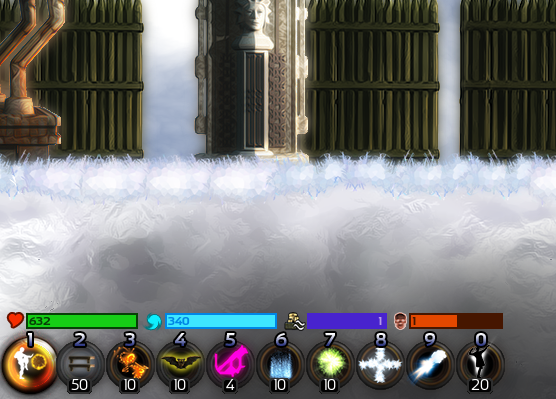 These towers that have several bosses in them, and at the top of the tower is the rare commodity that you saw on the world map. You will get EXP for killing each boss, and further EXP for bringing the crystal back to the Memory Archive in your settlement. At higher levels, the towers also can contain elusive crafting materials like sunstone or moonstone. Eventually, after your civilization gains a few levels. you will have to scout new regions to see what is in them (any regions above level 3 won't show you their icons automatically). To scout regions you must first expose them on the world map by moving around it. After that, go into a settlement and speak to the Hearth Guardian Stone, and you will then be able to assign the NPCs living in your settlement to go explore for you. Once a region is scouted, you will be able to see if there are any resource stashes in it that will aid your settlements, or things like evil outposts and overlord lairs, which contain the big bosses for this part of the world. One final thing: remember those warp scrolls we talked about? Well, any time you are in the side view of the game, simply open your dungeon/chunk maps by pressing either comma or period. Once these are open, you can click on any part of the map you have already been to and you will automatically warp to that area. So, for example, if you are deep into a large building, using these will allow you to leave the building without having to back track through every room. That should be enough to get you going. 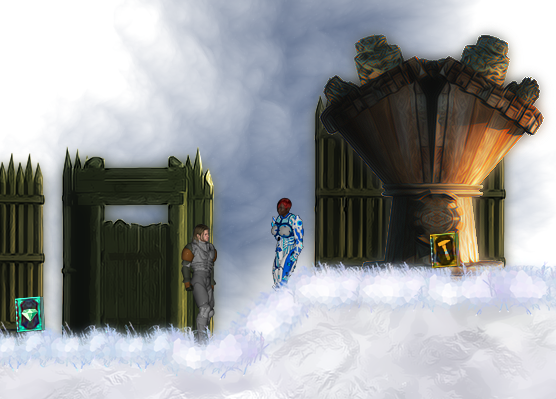 I don't want to give you everything, since this is a game about exploration, after all. Happy adventuring! Does this mean the beta's going live very soon?